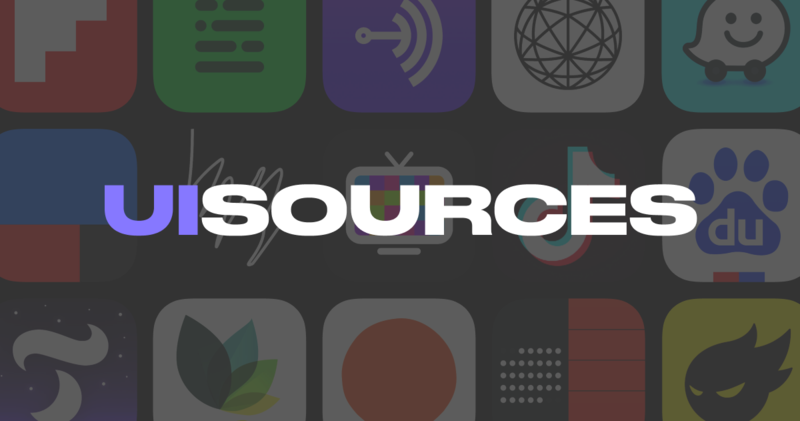 I built UI Sources to document micro interactions, animations and product flows from the best designed and top grossing apps. Checking out other apps is an important part of my design research, and I wanted to build something to help other designers. 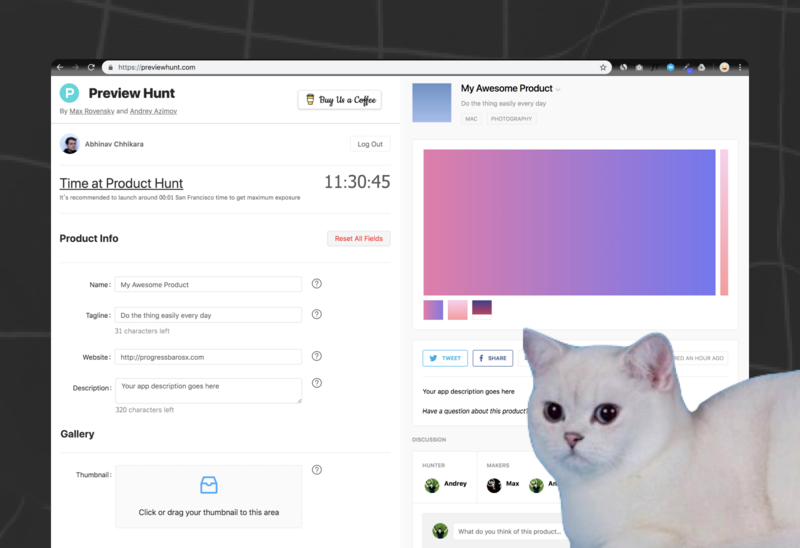 After a month of internally testing and circulating among friends, I decided to submit it to ProductHunt. Last I'd submitted something was in 2016 for my music app, Lisn which ended up being #3 product of the day with about 800+ upvotes. As a result, I had a pretty good idea of what it took to make a good impression. If youâ€™re planning to launch on ProductHunt anytime soon, hereâ€™s a few actionable tips to make the most of it. Thereâ€™s a few things you can prepare in advance before your launch. I used Andrey Azimovâ€™s great tool PreviewHunt to do it, but you use whatever youâ€™re comfortable with. Animated GIF thumbnail: This is a great way to catch attention. You donâ€™t necessarily need to hire an animator to make something snazzy. You can just put together a bunch of screenshots or images, load them up in Keynote and record your screen. Alternatively, you could use a tool like Product Hunt Gif Maker. â€�Gallery: These should be images of your product that convey what it does. For my listing, I decided to go with a banner image, screenshots and a GIF of one of the top pages on my site. Keep in mind that the first image you upload here will be the meta image that shows up when people share it on social media. So pick something that looks great! Description and first comment: Write a comment about why you built it, challenges you might have faced, the problem you want to solve etc. so other makers get some background about the product. 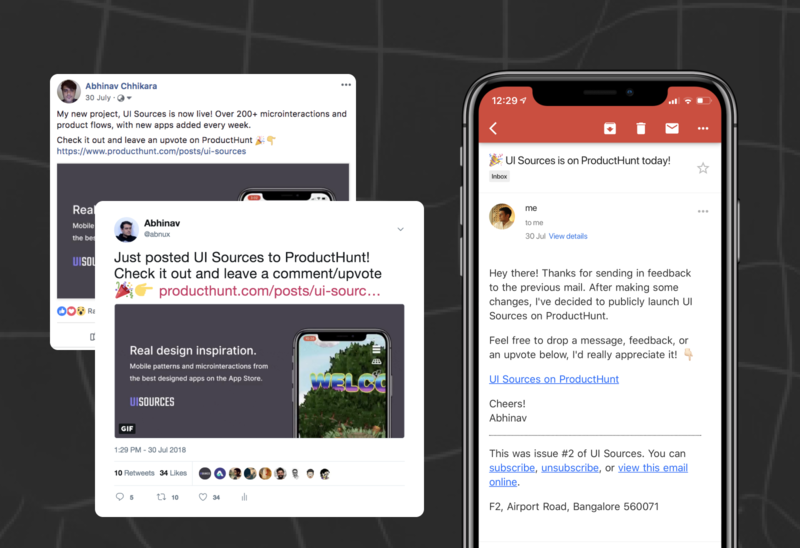 â€�â€�ProductHunt is a community of makers and it helps to engage in conversation rather than just post something and forget about it. Comments also encourage more people to ask questions, which can be good to get the conversation going. More comments probably lead to a higher ranking in the daily charts, so engage in useful discussion! Post your product on Facebook, Twitter, LinkedIn or wherever else your friends follow you. Itâ€™s alright to do this as long as youâ€™re not trying to manipulate the system for upvotes. 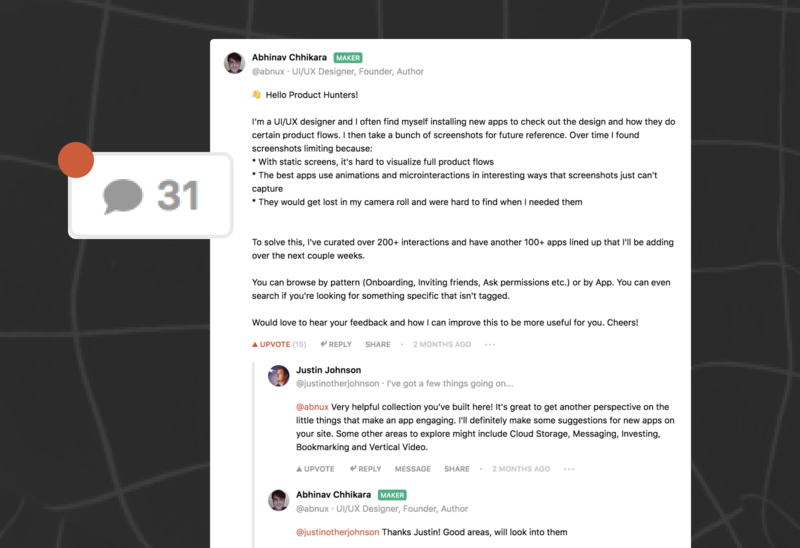 In addition to this, I also sent out an email to my newsletter subscribers letting them know that I was on ProductHunt today and that Iâ€™d appreciate them leaving a review or a comment. If your product ends up doing well, it could send a lot of traffic to your site. Use this opportunity to present value and get people to give you their email. For UI Sources, I added a banner on the top pages so that people would sign up after browsing for a while. Iâ€™ve also seen some products ask for your email in exchange for an e-book or something similar. Iâ€™ve seen some products do this, but I chose not to for my launch. When someone clicks through to your site via ProductHunt, the URL is appended with a ?ref=producthunt. You can detect this and show a welcome banner to visitors, which might be a nice touch and a way to personalise the journey. 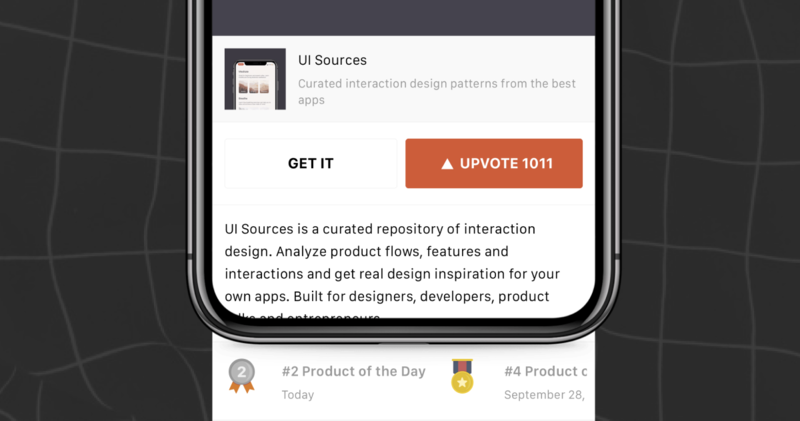 If youâ€™re building a SaaS tool or a paid product, you can also add a coupon code to this banner to offer a special discount to ProductHunt users. IntroBar is a tool that helps you do this. 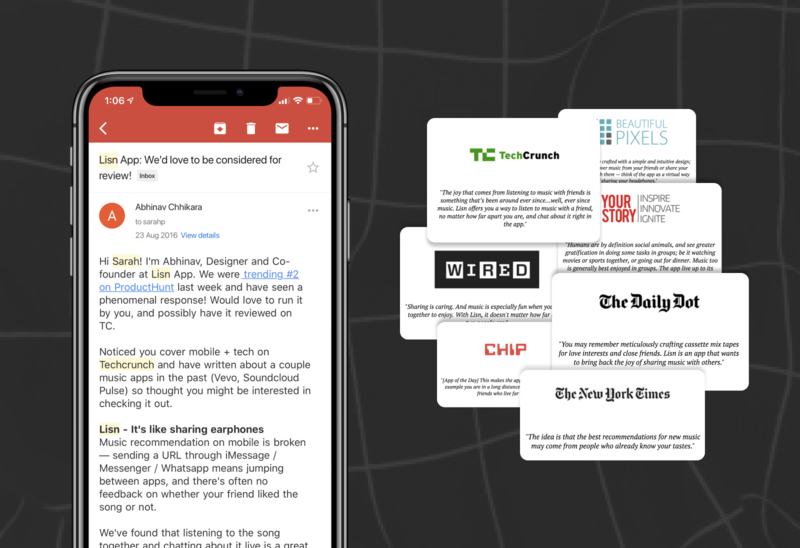 I didnâ€™t do this for UI Sources, but this is something that worked very well for us with Lisn and ended up getting us featured on TechCrunch, Wired, NYT and more. Tech journalists are on the prowl for new, interesting products all the time and they probably get a couple pitches for stories every day. However most of these are either bad, or just asking for something without showing any validation. If youâ€™ve done well on PH, this can be a great positive signal to them. Send them a personalised email and mention something like â€œOh and btw, we were recently trending at #3 on ProductHunt!â€� If you can do this successfully and get a few publications to write about you, use that as further social proof when pitching to more journalists. 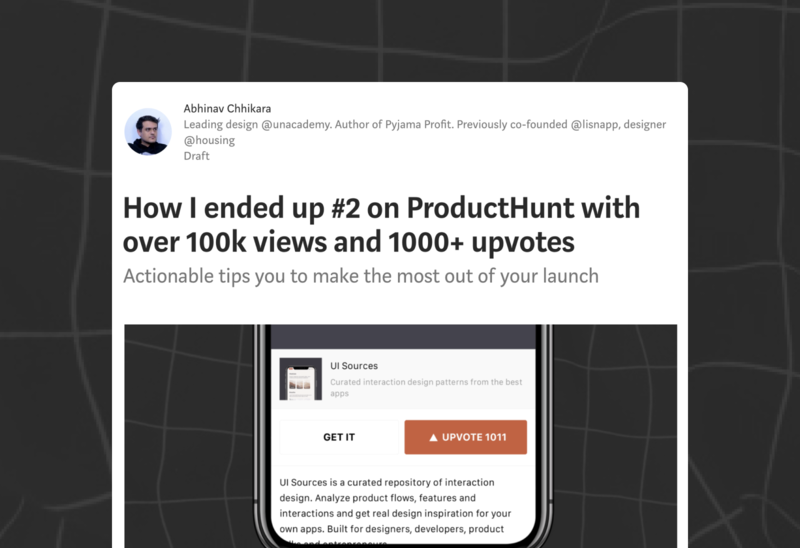 After youâ€™re done with your launch, write an article titled something like â€œHow I ended up #2 on ProductHunt with over 100k visits and 1000+ upvotesâ€�. PH lets you embed your product on external pages, so donâ€™t forget to do that and ask your readers to upvote if they enjoyed the article. Thanks for reading! Drop me a tweet on @abnux if you have any questions or if there's anything I can help you with. Also, do check out UI Sources! 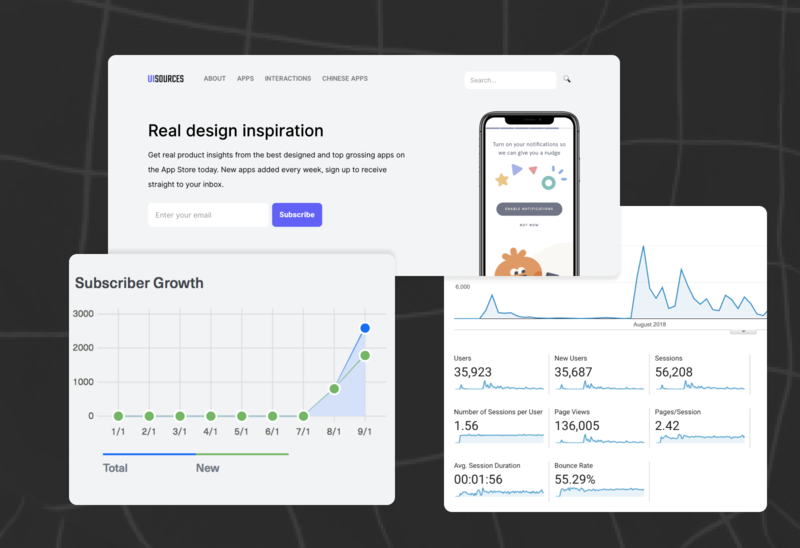 If youâ€™re a designer, developer, product manager or just someone who enjoys well designed apps, then Iâ€™ve got just the site for you.